Since 1972, Dynamics Corporation is in the business of “providing one-stop-vibration-control-solutions for industries and institutions of all types and sizes�. For about 4 decades and 3 generations now, we have zealously stuck to our core-competency of “vibration-control�, building on experience of working with India’s most reputed governmental, semi-governmental and private-sector institutions. From railways to power projects, from small manufacturing units to mammoth refineries, we’ve been there, seen it all and mastered the art. Not surprising, we are often referred to as “anti-vibrations experts�. As a family-run concern, we bring to our business the passion and commitment of a start-up entrepreneur and the ethics and standards of a thoroughly professional and matured organization. We believe in hands-on management and have kept our structure a family-owned-and-managed one, mindful and concerned of not becoming a faceless behemoth. We value business, but more importantly, we value values. 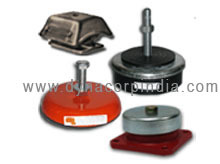 Although “anti-vibration� remains at our core, a growing demand from our very satisfied clients of offering other industrial products, saw us venture into the manufacture and supply of industrial rubber products such as rubber sheets, electrical insulating mats, rubber pads, O-Rings, gaskets, oil seals, diaphragms, rubber bellows , rubber expansion joints, rubber bushes, rubber cords, rubber profiles, buffers and many more customized rubber products besides the manufacture and supply of expansion type fasteners, nylon sleeves and fabricated items such as industrial trolleys and industrial ovens.